Representatives of the government of India and the GPRN/NSCN (Khole-Kitovi) , agreed to extend the cease fire for another year with effect from April 25,2014 after a meeting at Police Complex Chumukedima Friday. It was the second such meeting in Dimapur. The first was when representatives of the government of India and the NSCN (I-M) extended the cease fire on July 31,2007. 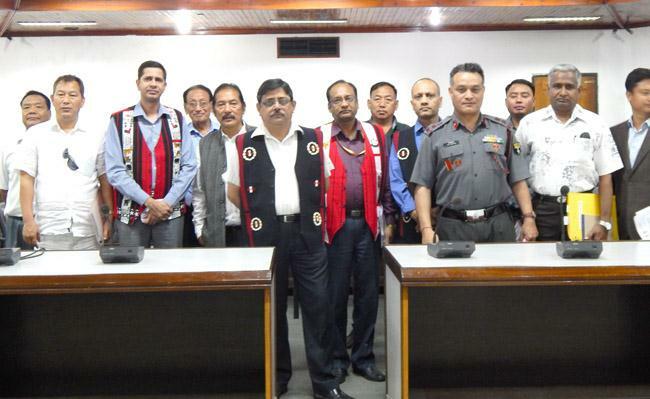 Joint Secretary, ministry of home affairs (NE) Shambhu Singh, signed on behalf of the government of India while C.Singson, Supervisor of Cease Fire Supervisory Board (CFSB) signed on behalf of the GPRN/NSCN. Coming out after the closed-door meeting , Shambhu told media persons that the government of India decided to extend the truce for another year as it did not wish to fritter away years of goodwill. GPRN/NSCN supervisor C. Singson, who was also present, described the meeting as “satisfactory” and also disclosed, that the representatives of the government of India reiterated that they were satisfied with the present cease fire. Asked whether the Centre was ready to hold negotiations with both GPRN/NSCN and NSCN (K) with whom it has been in cease fire for years, Shambhu Singh said the Centre was currently not in a position to initiate talks with other groups, till dialogue with NSCN (I-M) was settled. Shambhu pointed to “certain conditions” in the cease fire agreement with NSCN (I-M) that “unless we have spoken to them, hand over papers to them. We will not be in a position to ask anybody else to come.” Asked , if it meant that the other groups would have to wait till settlement was arrived at with NSCN (I-M), Shambu replied: “most likely, yes”. When told that the GPRN/NSCN was willing to start dialogue, Shambu acknowledged it and added “please wait”. On NSCN (I-M) general secretary Th.Muivah blaming the government of India for delaying solution, Shambhu said the issue was between the government’s interlocutor and the NSCN (I-M). “I am no one to comment. I would rather not speak about it because I don’t talk to them. Only the interlocutor talks to them”, he said. On the outcome of the meeting, Shambhu said it was basically for extension of the cease fire and to review any “serious mistakes” so as to take corrective measures. Ask about extension of cease fire with NSCN(K), he said it would depend on whether the group approached the Centre. Shambhu disclosed that NSCN (K) has not yet approached the government of India. Reacting to Shambhu Singh’s statement, GPRN/NSCN supervisor C. Singson termed the dialogue between the government of India with NSCN (I-M) as a “mistake” and said the Centre should admit it. Meanwhile, talking to Nagaland Post on the sidelines he said it was a mistake on the part of the government of India to start talk only with one group by thinking that it would solve the Naga issue. Even after 15 to 16 years of talking, no solution has materialised, he said. Singson explained that the talks with NSCN (I-M) has become a “stumbling block for all other groups” as any settlement would not be acceptable to them. Singson said there was no transparency in the talks and despite the past 15 to 16 years, both have failed to find any solution. He said since nobody knows what was being discussed except the two sides, it has become “ a stumbling block for Nagas to come forward”. He also said Nagas, especially, Naga Political Groups (NPGs) were all responsible for the situation and need to work out something. Singson said cease fire was within Nagaland and so it was the responsibility of the government of India to tackle and solve the Naga problem. In pursuance of the cease-fire as originally agreed to on 25th July 1997 discussions were held between the representatives of the government of India led by K. Padmanabhaiah and the National Socialist Council of Nagaland led by V.S. Atem, to finalize the ground rules and modalities for the implementation of the cease-fire with a view to ensuring continuance of an effective cease-fire to pave the way for a peaceful and meaningful political dialogue. The agreed ground rules were finalized on 12th December, 1997. With a view to make the ceasefire more effective and to create a proper and conducive atmosphere for a peaceful and meaningful political dialogue, further discussions were held between the representatives of the Government of India led by M.B. Kaushal and the National Socialist Council of Nagaland led by V.S. Atem in November, December 2000 and January 2001. Both sides noted that the current cease-fire between the Government of India and the NSCN is valid up to 31.7.2001.
f) The NSCN will notify to the CFMG time list of all their camps. These lists would be placed before the CFMG and, after due consultation, would be declared by the CFMG as designated camps. In the interest of promoting peace process, there would be no parading (either in groups or individually) of NSCN cadres in uniform and/or with arms. For the present, this would cover all populated areas, public transport and highways (Highways means national highways, state highways and roads connecting district headquarters to state capital, district headquarters to district headquarters and district headquarters to sub-divisional headquarters). For the movement of NSCN armed cadres from one designated camp to another, the concerned army/paramilitary forces post would be given prior intimation. While proceeding through a village, the arms will be concealed. The modalities of his would be finalized in the CFMG. Persons from NSCN requiring to move frequently will have his photo identity cards, which would be issued in the format mutually agreed upon. These identity cards, not to exceed 60 at present, would be issued by the NSCN and be countersigned by the Chairman CFMG. The holders of these identity cards would, for their personal security, be entitled to have one NSCN armed cadre each accompany them at all times. The weapons would be carried in a concealed fashion. (k) On the Government of India side, a concern was expressed about reports of forced recruitment to armed cadres. The NSCN representatives stated that they have not and do not resort to forced recruitment. However, in the interest of promoting the peace process, it was agreed that if there are any reports of forced recruitment, they should be discussed in the Monitoring Group. (a) These ground rules will be valid only for the state of Nagaland. (b) Enforcement of the ground rules will be the responsibility of the GoI. The GoI and NSCN will jointly implement the ground rules. Contentious issues relating to the implementation of the ground rules will be resolved by a Cease-Fire Supervisory Board (CFSB) comprising live representatives each of GoI and NSCN and a Chairman to be nominated by the GoI. (c) The NSCN would not undertake offensive operations like ambush, raid, sniping and attack leading to death/injury/damage or loss of property against anybody. The NSCN would also act in a manner as not to cause harassment/damage or loss of property or injury to the civilian population. (d) There would be no offensive operations like ambush, raid and attack leading to death/injury/damage or loss of property against the NSCN by the Indian army, paramilitary forces and the police. However, the Government of India reserves its right to continue operations against all other militant groups who are not a party to the ‘cease-fire’. (c) NSCN will notify to the CFSB, the list of all their camps. The CFSB would, after due scrutiny, finalize the list of the “designated camps” where all the armed cadres of the NSCN would be located within three months. (f) In the interest of promoting the peace process, there will be no movement in uniform and/or with arms outside “designated camps’. (g) Movement of NSCN cadres from one “designated camp” to another will be carried out for mutually agreed purposes and with intimation to the Security Forces and CFSB. The modalities of this would be finalized by the CFSB. (h) The NSCN would refrain from blockade of roads and communications and from any activity which would disturb the functioning of local and State governments and of economic or developmental activities as well as essential services. k) The NSCN will refrain from extortions, forcible collection of money and supplies and intimidation of individuals including government officials. (l) The NSCN will refrain from forcible recruitment of armed cadres. (m) Patrolling by the Indian army, paramilitary forces and the police would continue to prevent infiltration of militants and arms as hithertofore. However, patrolling within one km of the “designated camps” decided after due consultation in the Cease Fire Supervisory Board (CFSB) will be carried out, with intimation to them. It is noted that no such camps are located/will be located in populated areas, and/or near highways, Indian army/para military forces posts, police station/police posts, etc. (n) Protection of convoys and patrolling of road would continue to be undertaken by the Indian army, para military forces and police.